I woke up this morning feeling a bit like this guy. This is one of my Acronicta americana, in its fifth or sixth instar. Very scraggly looking, missing a few black tufts… hopefully if he molts again he will get fluffed up back to normal. Luckily for me, I can brush my hair and throw it under a bandanna. 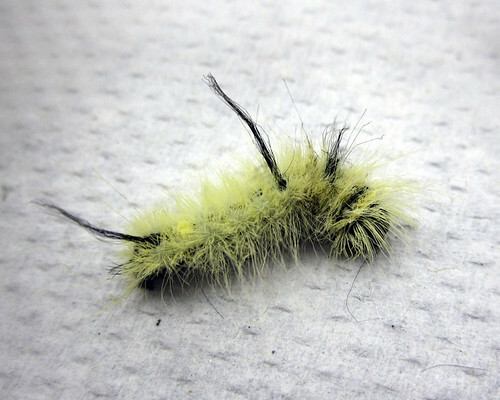 This guy has to parade his appearance around all the other pretty caterpillars… oh well. He’s got some company, at least one other individual is missing his second set of black tufts altogether. That one is in the middle of a molt, so we’ll see what happens next. Posted on June 16, 2011, in Acronicta, Acronictinae, Invertebrates, Lepidoptera, Noctuidae. Bookmark the permalink. Leave a comment.